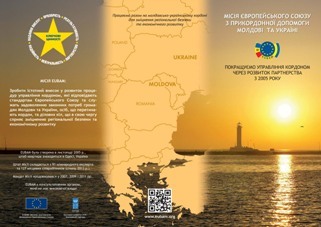 The European Union Border Assistance Mission to Moldova and Ukraine (EUBAM) has issued a new leaflet to illustrate its contribution to the improvement of the management of the border between the two countries. Since 2005, EUBAM has served to improve border management and enhance regional security, supporting the economic development of the region. EUBAM has set a number of ambitious goals including more professional Moldovan and Ukrainian border agencies, improved cross-border cooperation and border security. Thousands of staff members of Moldovan and Ukrainian border agencies benefited from EUBAM training on EU standards and best practices. In 2012, Moldovan and Ukrainian border-guard officers, supported through EUBAM capacity-building initiatives, began jointly patrolling the common border for the first time. EUBAM also played an important role in the resumption of the Chisinau-Odessa passenger railway line in 2010 and facilitated a trilateral process that played a part in the full resumption of cargo-rail traffic through Transnistria in 2012. EUBAM support was, moreover, instrumental in getting the Jointly Operated Border Crossing Point (JOBCP) project at Rossoshany-Briceni off the ground in 2012. The JOBCP is the first crossing on the Moldova-Ukraine border to operate according to EU standards. EUBAM has also played an important part in assisting Moldova and Ukraine in seeking visa-free travel to the EU for their citizens. EUBAM has provided expertise and equipment to the Joint Ukrainian Moldovan Commission on Border Demarcation since March 2008.